Being a girl is awesome. I believe in equal rights for men and women, and I think that women athletes and soldiers are inspiring. Men and women are equally intelligent, although in different ways, and can both make productive members of society. I am pursuing a bachelor’s degree in social work and plan on obtaining a master’s as well. But I have a secret. Deep down I am a stereotypical girl. I love cooking and baking. I love decorating and making crafts. I love fashion and beauty. I dream of getting married and being a bride. I long for having my own family and my own house to keep. Seriously, I should have been born in the 1950’s. And you know what? There is nothing wrong with this. This is who I am, and it is what God has created me to be. I used to be embarrassed to say that one of my greatest dreams was to get married and have children. Now I’m not. You can call me traditional and old fashioned, but I don’t really care anymore. One of the reasons I chose the career I plan on going into was so I could become a counselor with a flexible schedule, so I could spend more time homemaking! It still feels awkward to write this–which is probably why this post has been put up so late. I know that a lot of Christian women are more traditional like me, but there are always those who might say that I am too young to be thinking this way. Of course I have more goals for my life than becoming a wife and mom. I am pursuing my education and plan on using my degree to serve others. I also want to stay actively involved in my church and community–no matter where God places me. I love my family and friends dearly, so my goals are also to serve them. I am learning to embrace the femininity that God has given me. Of course, everyone woman is different. Not all of us are super domestic or love fashion, but God has given all of His daughters a precious feminine spirit that should always be joyfully expressed. But what does Biblical femininity look like? Let’s turn to scripture! Do not let your adornment be merely outward—arranging the hair, wearing gold, or putting on fine apparel— rather let it be the hidden person of the heart, with the incorruptible beauty of a gentle and quiet spirit, which is very precious in the sight of God (1 Peter 3:3-4 NKJV). A Godly woman’s feminine beauty comes from within–by a gentle and quiet, loving spirit. that they admonish the young women to love their husbands, to love their children, to be discreet, chaste, homemakers, good, obedient to their own husbands, that the word of God may not be blasphemed (Titus 2:4-5). A Godly woman is pure and modest. If she is married, then she is loving and faithful to her husband and children. A feminine woman takes care of her home (even though this will be unique for every household). She girds herself with strength, And strengthens her arms (Proverbs 31:17). Whoever says women aren’t strong has obviously not read Proverbs 31! Although most women are physically weaker than men to some degree, we have our own strength. A Biblical woman is industrious and resourceful. She works hard to provide for her family and take care of those in need. She knows how to roll up her sleeves! 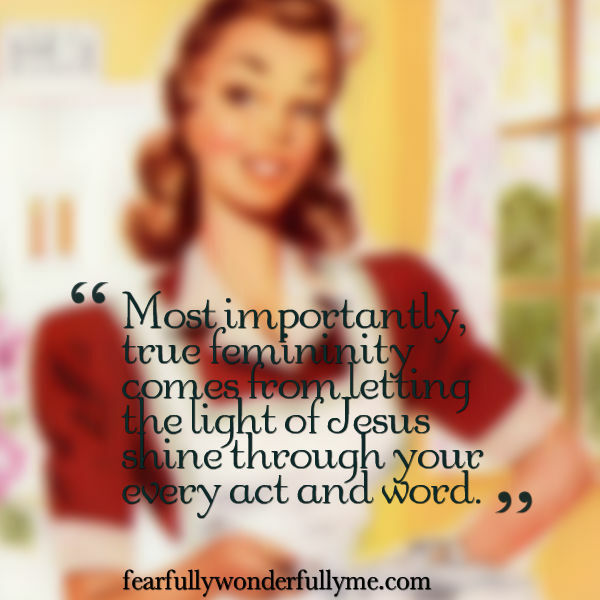 Most importantly, true femininity comes from letting the light of Jesus shine through your every act and word. So tell me ladies, are you embracing your femininity? In what ways can we emulate Biblical femininity in our modern world? I totally get what you’re saying about being embarrassed about only wanting to be a homemaker. I’m only 14 but I already want to be a stay at home mom when I’m older. 🙂 Sometimes, I’m embarrassed to say that, because everyone’s asking me if I’m going to college, and what career I’m pursuing….but there’s nothing wrong with wanting to be a homemaker! 🙂 Great post! Exactly! Women have a choice, so it’s up to us. The reason I want to be a counselor is so I can make a flexible schedule for when I have a family of my own. I think it’s always good to have education or job training to help earn money or for the future, but it’s a choice we make as we grow! Yeah. Plus you can always job shadow or take a class or two in things you might like. There’s endless options and you will figure it out. God will lead you! No I haven’t, but I will be sure to check it out!